Miami University Department of Theatre presents Eric Coble’s stage adaptation of Lois Lowry’s Gathering Blue with performances Nov. 15-16 at 7:30 p.m., and Nov. 18-19 at 2 p.m. in the Gates-Abegglen Theatre in the Center for Performing Arts. Gathering Blue is the second book in The Giver Quartet, a series of four young adult novels by Lois Lowry. The story follows a young girl named Kira who lives in a dystopian society that places no value on flawed individuals. Despite Kira’s twisted leg, she is kept alive because of her extraordinary talent for weaving. The community needs her help to weave the story of the future, however, the question remains — what kind of future will Kira choose to weave? The play is directed by Rosalyn Erat Benson, a long time resident of Oxford who recently retired from Miami University after many years as assistant dean of the College of Creative Arts and visiting instructor in the Department of Theatre. While at Miami, Benson directed Emotional Creature-the Secret Life of Girls Around the World, Angels in America Part One: The Millennium Approaches, Fool for Love, and other productions. She also served as faculty adviser for several student directed productions and was an actor in Miami University’s Summer Theatre. The production will feature a cast of seven local middle and elementary school youth performing alongside Miami University student actors. "The young people in Gathering Blue bring a tremendous amount of imagination and enthusiasm to the production," said Benson. "Watching the interaction between young people and college students has been educational, challenging and fun at the same time," she commented. "Both groups have learned from each other and have created a cohesive acting ensemble to tell the story of Kira’s journey to find blue. When the young people made a birthday card for one of the college cast members and presented it to her on stage, it was amazing to watch the other college actors get out their phone and take videos," she said. Tickets to the performance are $12 Adult, $9 Seniors, and $7 students, available at the Miami Box Office located in the Campus Avenue Building South Lobby (Room 034) or by purchasing online. Groups of 4 or more are entitled to a special discount price of $5 per ticket, available online or by contacting the box office at 513-529-3200. 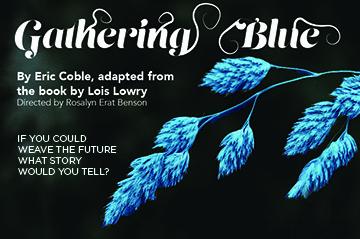 To learn more about Miami’s production of Gathering Blue, visit the Department of Theatre's website.